May Lord bless you and guide you in this wonderful year and His everlasting peace be within us. This time I write down the thoughts Lord gave on meditating the verse Revelation 3:20. Then I prayed to our Lord closing my eyes. “Lord… What made Zacchaeus to climb the tree top even when he was a wealthy man and was in a senior position? I am not able to understand. Please throw upon your light so that I can understand the truth. I was keeping the incident of the meeting of Jesus and Zacchaeus in my heart and all of a sudden I had an intuition, was he too stingy to spend his money or did he want to hide himself from people to see Jesus?”.However Zacchaeus didn’t want to waste the opportunity before him and gave himself a chance. When he heard that Jesus was to pass that way, he ran ahead and climbed the tree. He took at least this pain to see Jesus from a distance. But when Jesus came to that spot He looked up to Zacchaeus and hurried him to come down as He want to stay in his house. This is a reward Jesus gave to Zacchaeus for the effort that was taken. No one in the crowd got this reward. Zacchaeus hurried down and welcomed Him. Here is were Zacchaeus opened the door of his heart on hearing Jesus voice. Then He said I will give half my property to poor and if I have cheated anybody I will pay him back four times the amount. Jesus is the light of the world. When he opened the door for Jesus his house got the light and that made him to confess his sins and also take corrective actions. Only then our Lord Jesus said “Today salvation has come to this house”. So what is the learning from his life? 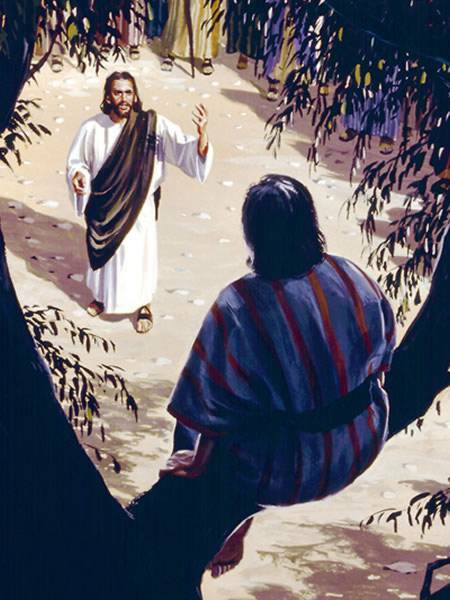 There could be many of us like Zacchaeus, wanting to see Jesus only from a distance. However if I give myself a chance to savour Christ, then Jesus will definitely recognize it to reward not just me, but my entire family, as He did to Zacchaeus. So let us open the doors of our heart and pray for the presence of our Lord so that our family be blessed and saved.